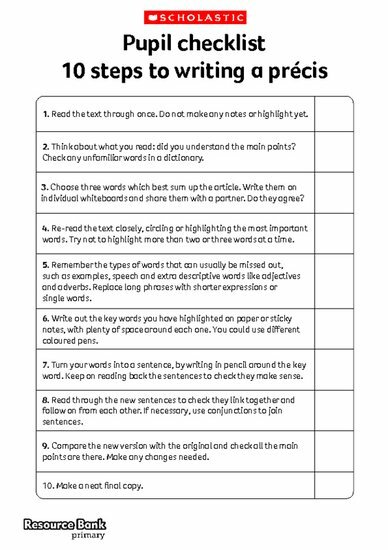 In the 2014 National Curriculum for English, a new skill is included in ‘Writing’ for Years 5 and 6: ‘draft and write by… précising longer passages’. Although note-taking has previously featured in curriculum documents, this is the first time the skill of writing a precis has been included. So what is a precis and how can it be taught in a useful and meaningful way to 9 to 11 year olds? A précis is a condensed version of a text, keeping the main points and order of the original. Usually it reduces the text to approximately a third of its original length. Learning to write a précis will help to develop children’s skills in writing clearly and concisely, pulling out the key information, whilst not copying word for word. Once you have explained to the class what is required in a précis, hand out a lengthy text and ask them to write a short précis of its contents. Distribute copies of this checklist so that they can make sure they’re getting it right.